The Barcelona Airport is located in the town of El Prat de Llobregat, which is 12 km from the city and has excellent transport links to the centre of Barcelona. There is a regular train service between the airport and Barcelona city centre that departs every 20 minutes and drops off at Paseo de Gracia, which is only 200 metres from the hostel (more information on www.renfe.es). Another way to get to the city is by Aerobus to Plaza de Cataluña, which runs from 6.00 am to 1.00 am. From Plaza Cataluña, it is a 15 minute walk to the hostel along Paseo de Gracia or you can take the L3 metro line from Plaza Cataluña station to Diagonal station (two stop, 2-3 mins). The N17 , night bus service operates between the airport and Plaza de Cataluña every 20 minutes from 10 pm to 5 am. From Plaza Cataluña, it is a 10-15 minute walk to the hostel along Paseo de Gracia. Guests can arrive at the hostel by Official Taxi , in Barcelona are yellow and black and have a green light on top to indicate availability. The city’s main train station is Sants, where national and international trains arrive. You can also arrive on the AVE (Spanish high-speed train), which connects Barcelona to Madrid, Lérida, el Camp de Tarragona and Zaragoza. Barcelona has other stations, but all trains stop at Sants station. 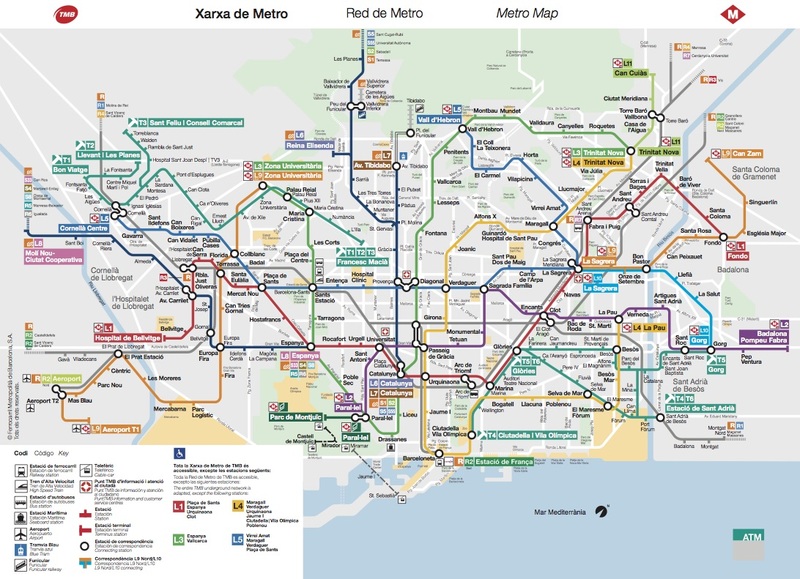 From Sants station, you can take the L3 metro line to Diagonal station (20 mins). Barcelona has numerous bus services that enable you to reach all areas of the city. The city has an integrated metro network that enables you to travel around easily. The city of Barcelona has 11,000 yellow and black taxis that are very easy to identify.